Scottsdale is a city located in eastern Maricopa County, Arizona. The city of Scottsdale has about 217 000 people. 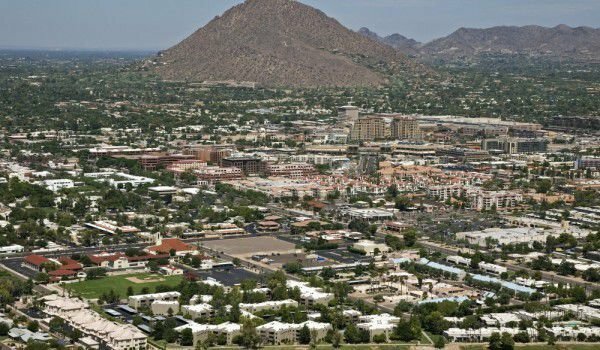 Scottsdale is surrounded by Phoenix, Tempe and Fountain Hills. Many years ago, on the territory of today's Scottsdale people from the Hohokam culture lived, which is one of the largest archaeological cultures of the territory which is today the American Southwest. From the eight-hundredth year after Christ, until the fourteenth century, that civilization inhabited this area and dealt with animals and plants. People from the Hohokam culture built a network of irrigation canals for their crops. They built a network of channels extending over two hundred miles distance. Much of this drainage system has survived to this day. Before the first European settlers, it was inhabited by Pima Indians. Some of the Pima Indians remained in their homes in the twentieth century. In the sixties of the twentieth century, a place where Indians lived in homes built by their ancestors still existed here. Pima Indians, who began to live in the city center, reconciled to their new homes which are preferred over the traditional ones. Many of the Pima and Maricopa tribes still live in the Indian community of the city of Scottsdale - a Pima Indian Community, in Salt River Maricopa. On the territory of Scottsdale, in 1868 was built the powerful sewage irrigation company Swilling Irrigation Canal Company, whose purpose was to reconstruct the original irrigation system built by the Hohokam culture. In early 1880, the American officer Winfield Scott bought six hundred and forty acres of land for the price of two dollars and fifty cents per acre. His brother - George Washington Scott became the first resident of the city, which at that time was known as Orangedale. Scott brothers were known as excellent and innovative for their time farmers who successfully cultivated citrus crops, potatoes and almonds in the desert town. The brothers Scott encouraged others to assist them in their efforts to turn desert land into blooming gardens, which have good earnings and other enthusiastic farmers soon appeared. In 1894 the town was named Scottsdale, named after the Scott brothers, who were founders of the development of farming in the area. In 1912 near Scottsdale was built the first luxury resort. The town was incorporated in 1951. Indian Bend Wash, which is actually a dried riverbed, collects sediment during heavy rains. For many years, the town could not allocate the budget to build bridges over the dried river bed. In the sixties, Indian Bend Wash began to fill with sediment more often, which created the danger of flooding. Then they had to make a big cement channel in the river and to build stable bridges in several places. In the fifties of the twentieth century it became popular for the production of heating systems, which created jobs and attracted new people and investment on its territory. Emerging new luxury houses attracted the newly rich, and therefore Scottsdale received the nickname Snobbsdale.